Collar ID tags are a wonderful line of defense for lost cat, but collar ID tags can also become physically separated from your pet. However, microchipping cats ensures that they can be properly and quickly identified by a veterinarian or animal shelter. We strongly believe in the value that microchips bring to the cause of lost cats. Therefore, we want to provide you with insight and education about microchipping cats. 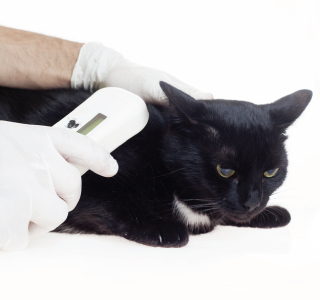 A cat microchip is implanted through a syringe that injects it underneath the skin. Although there is no universally agreed upon location, a cat microchip is usually implanted between the shoulder blades. At approximately 1cm long, it is about the same size as a grain of rice. Implanting a cat microchip only takes a few seconds, and it is meant to last for the entirety of your cat's lifetime. Once the veterinarian or shelter gets the chip's number, as well as the information about the company that made the chip, they'll contact that company to find the cat's owner.